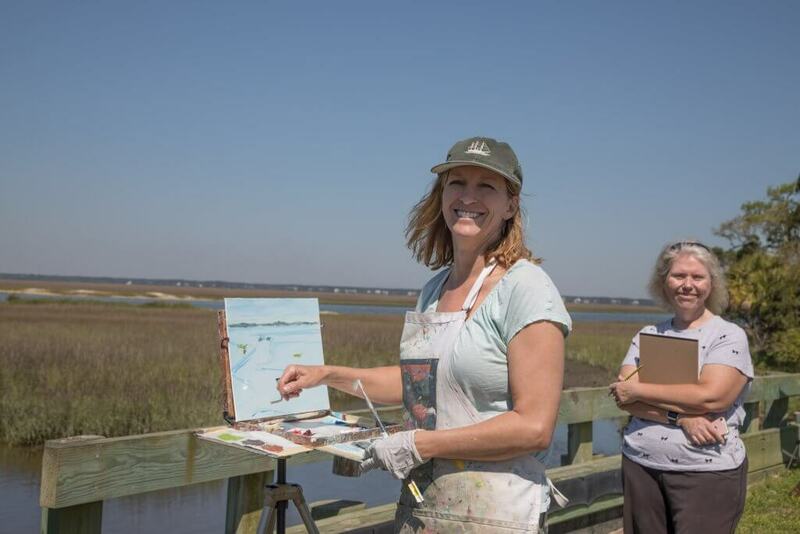 Saturday brought a flurry of artistic energy as local artist Sheryl Stalnaker led her students and interested residents in a plein air painting class. 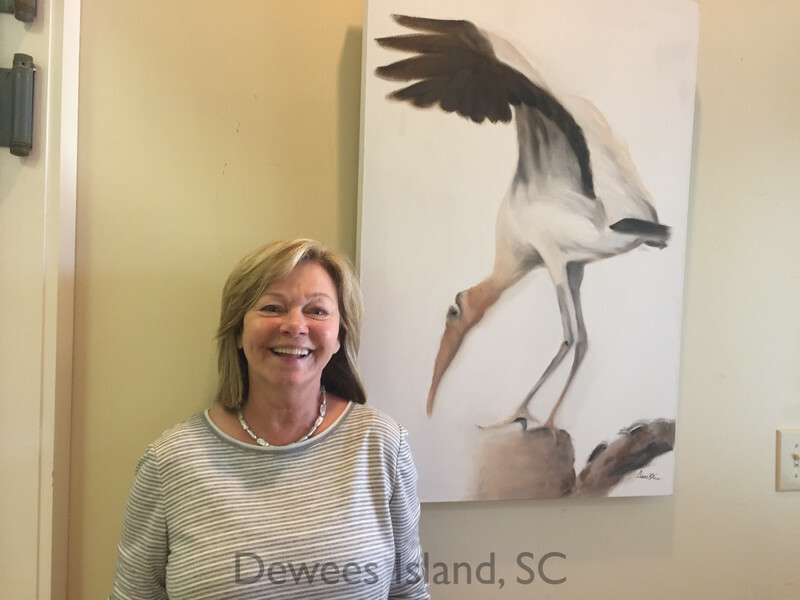 Stalnaker, who displays her work at The Martin Gallery, first came to Dewees Island a few years ago for a tour with a church group. 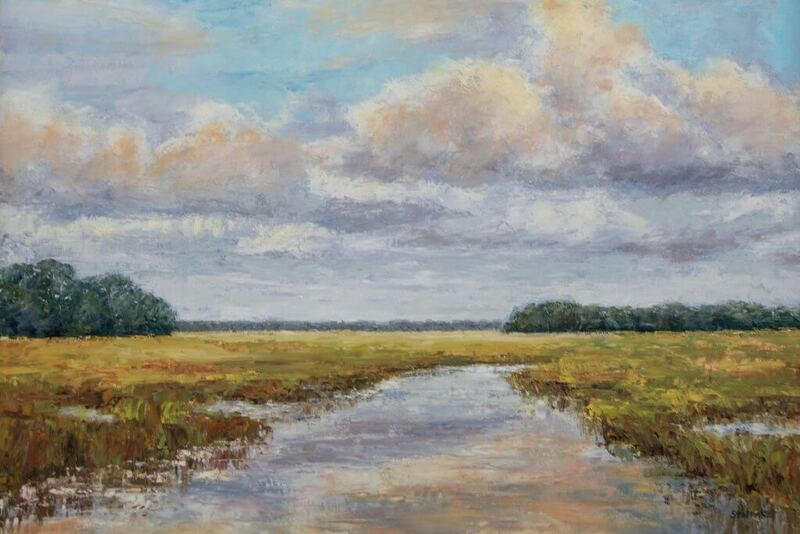 As she says in her artists statement on her website, she is drawn to wild places. 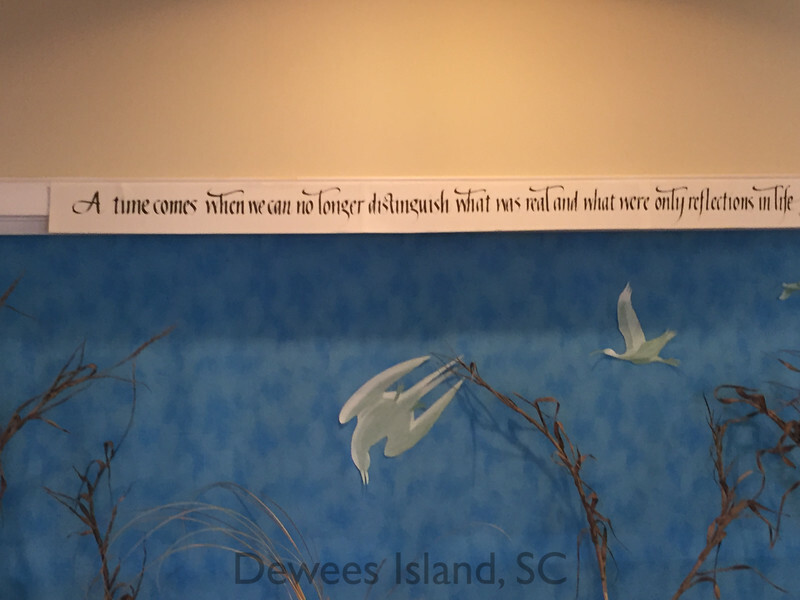 There is a Dr. Seuss quote I like from his book Oh The Places You’ll Go that says, “It’s opener there in the wide open air.” That is the feeling I had on Dewees. I knew it would be a great place to hold an outdoor painting workshop with the added adventure of taking the ferry to the island and driving around in golf carts! There are fewer and fewer unspoiled landscapes in this area. 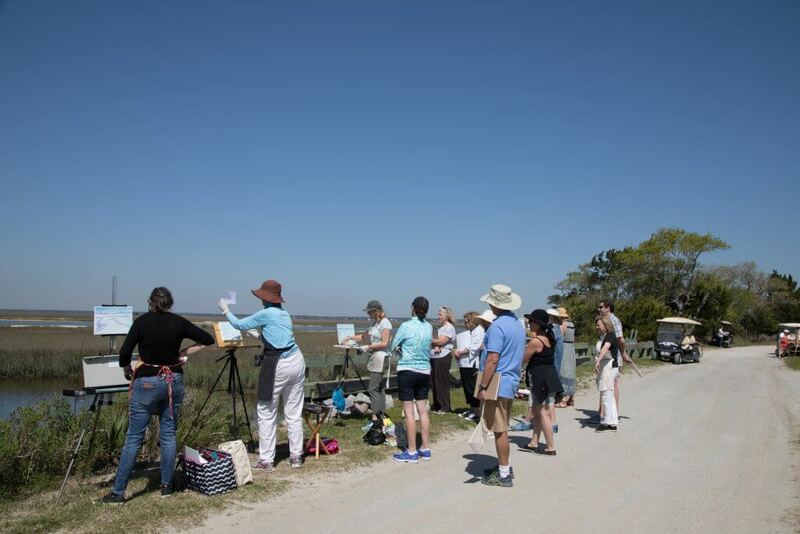 So on Saturday morning, some of her regular students joined our artists group for some instruction in painting outside. 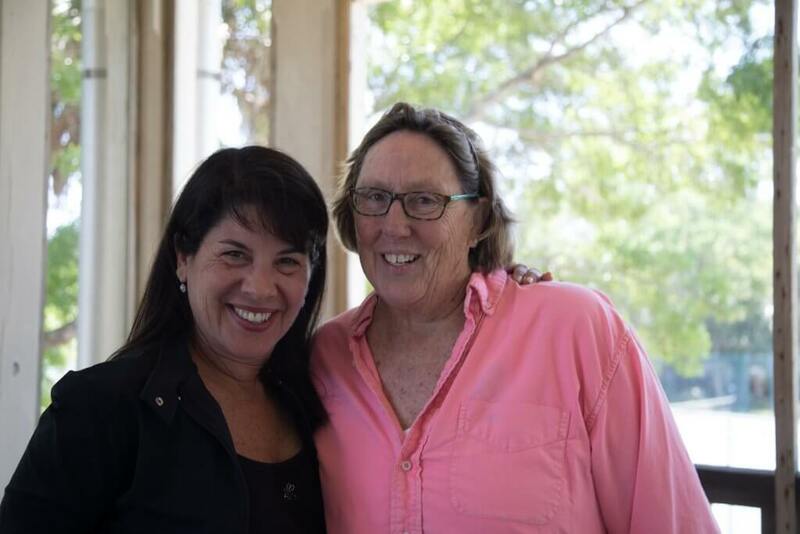 Topics covered included how to gather reference material on location, how to simplify and zero in on a painting subject en plein air, and how to capture the essence of a scene quickly before the light changes or the rain moves in. 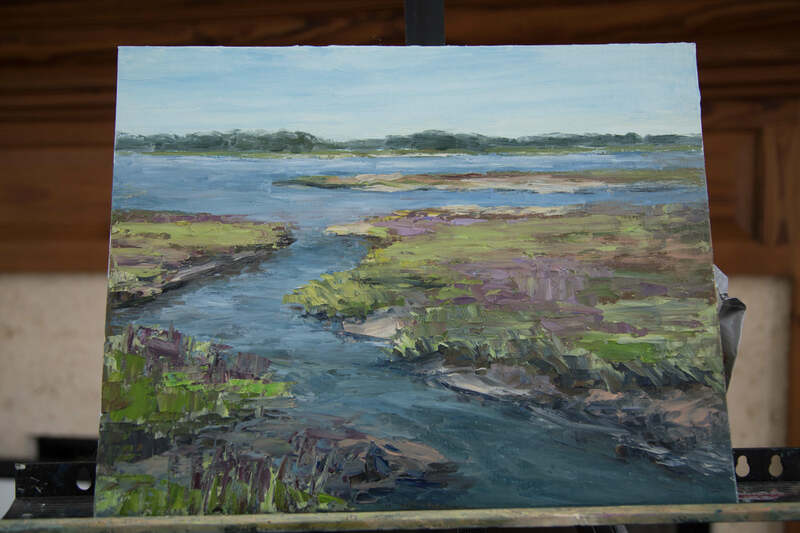 Island artist Kathy Warren lauded it as one of the best Plein air workshops she ever attended, and many others were equally enthusiastic in their praise. 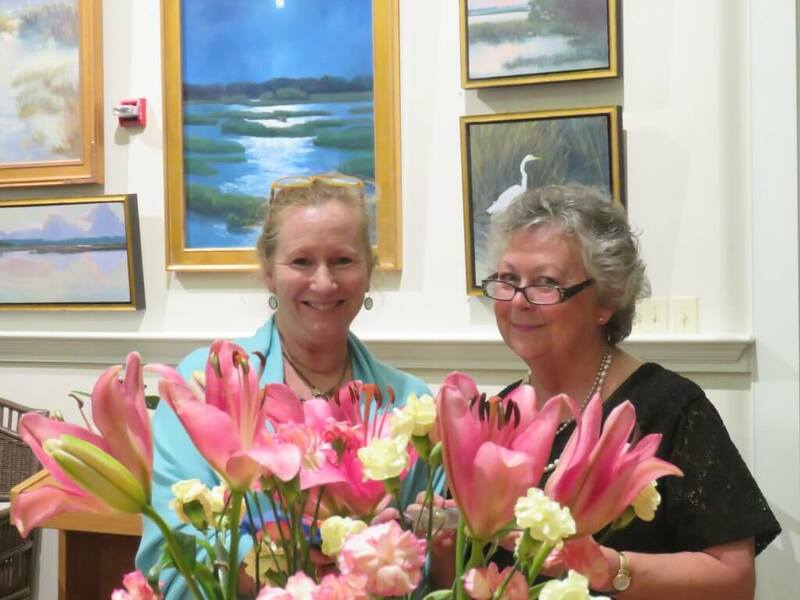 Mother/daughter group Ann Sweeney and Sonya Demmler from Columbia were enjoying their first visit to Dewees, as were Chris Richardson from Sullivans Island and April Auerbach from the Isle of Palms. 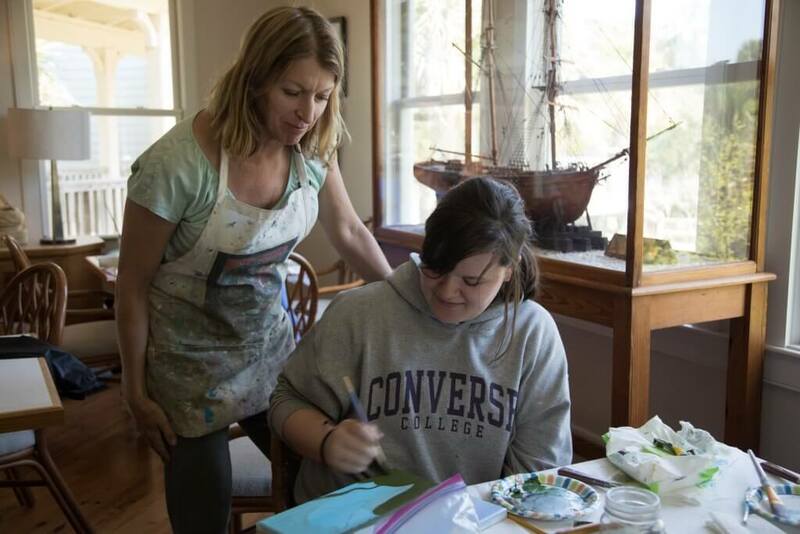 Emily Painter, a senior in high school who is a home schooling student of Sheryl’s, enjoyed “Dewees’ pretty scenery”. 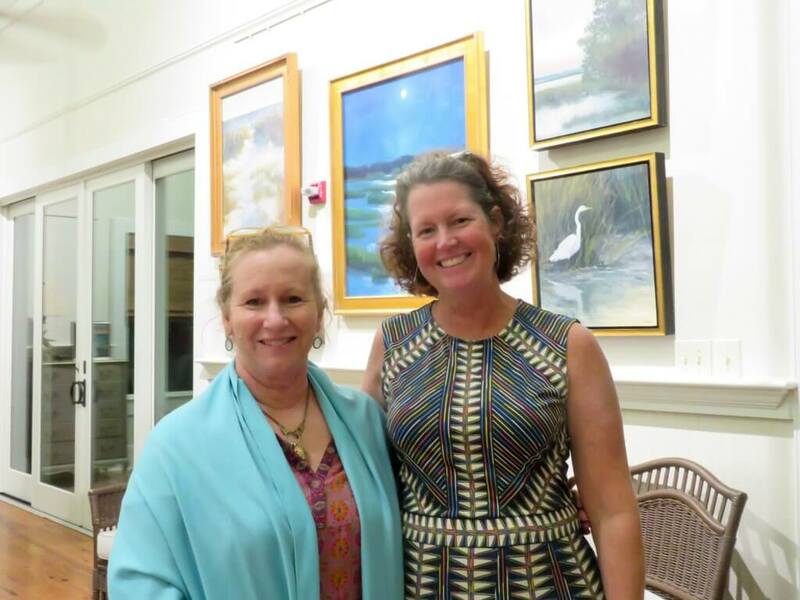 Susan Mashman, another island resident who had had her own art shows on Dewees, called the workshop “really inspiring. 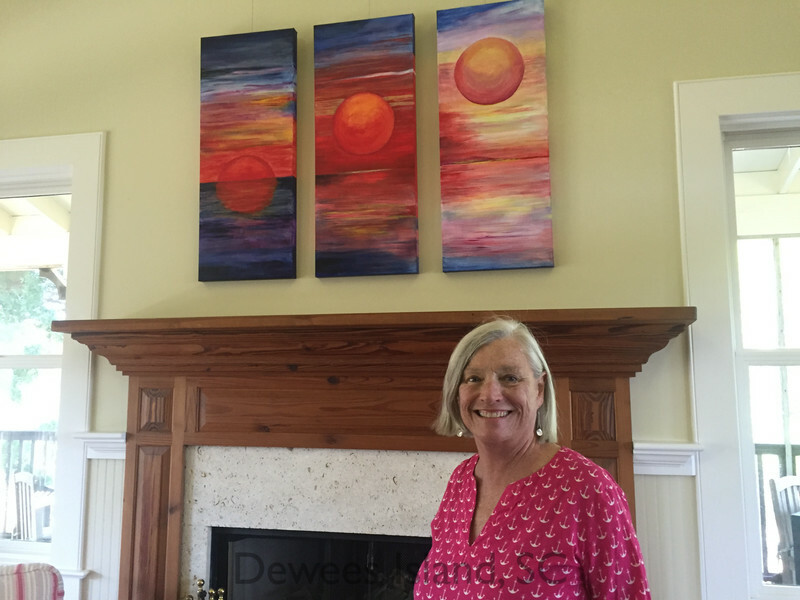 I’ve never worked in oils, and I am excited to try a new medium.” Esther Piazza Doyle, an island resident who exhibits both on Dewees and galleries in NC and Charleston’s Spencer Gallery, also had a great day outside. 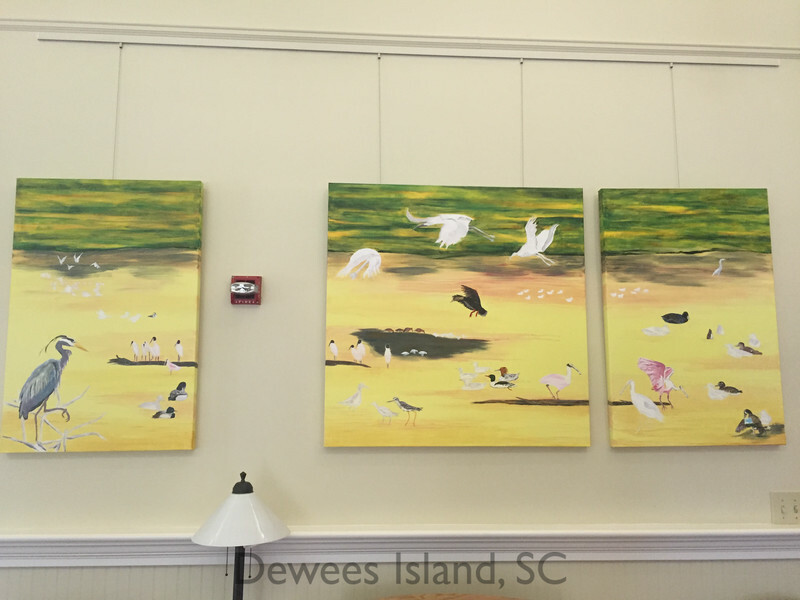 The Dewees Island Arts council provides a wide variety of art shows, classes and field trips. We’re looking forward to more from this artist. The art for the annual meeting is always a great production. 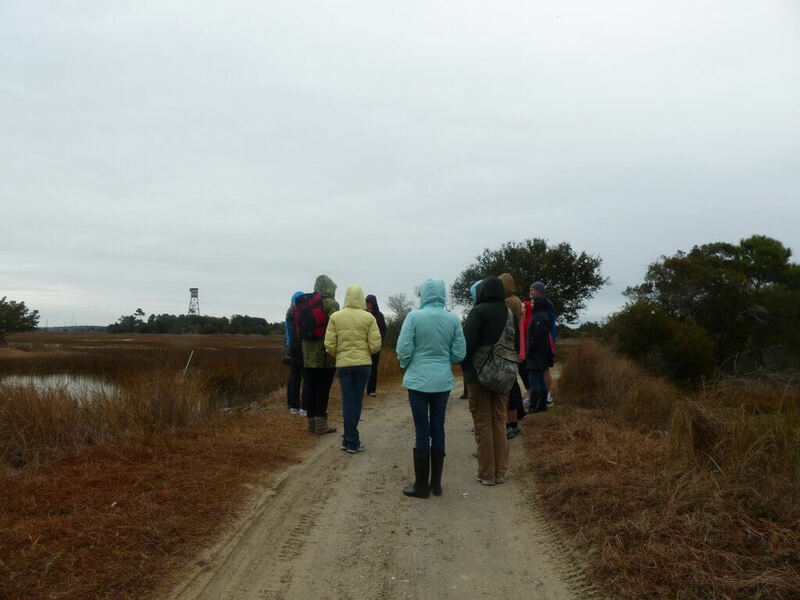 This year’s theme was the Lake Timicau Restoration Project, kicking off this fall. 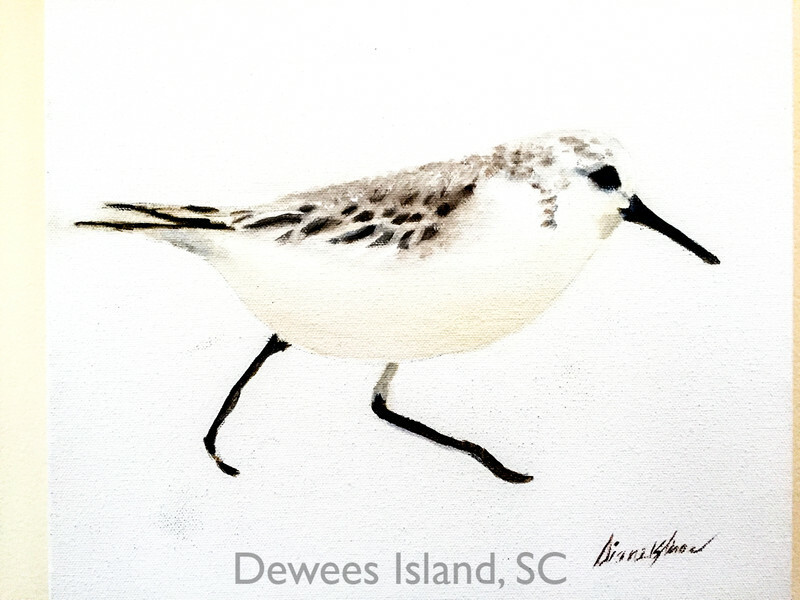 The artists who provided art for POA weekend wanted to bring attention to the shorebird species we would be helping, the areas that might change with new water flow, the ways people might use the restored areas differently, and the beauty of the environment. 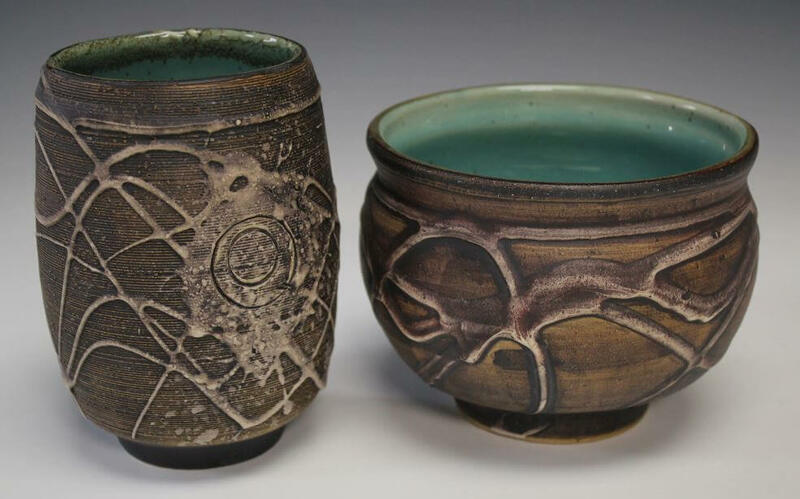 Some of these pieces will be featured again tonight at the Art Reception and toast at 5:30. 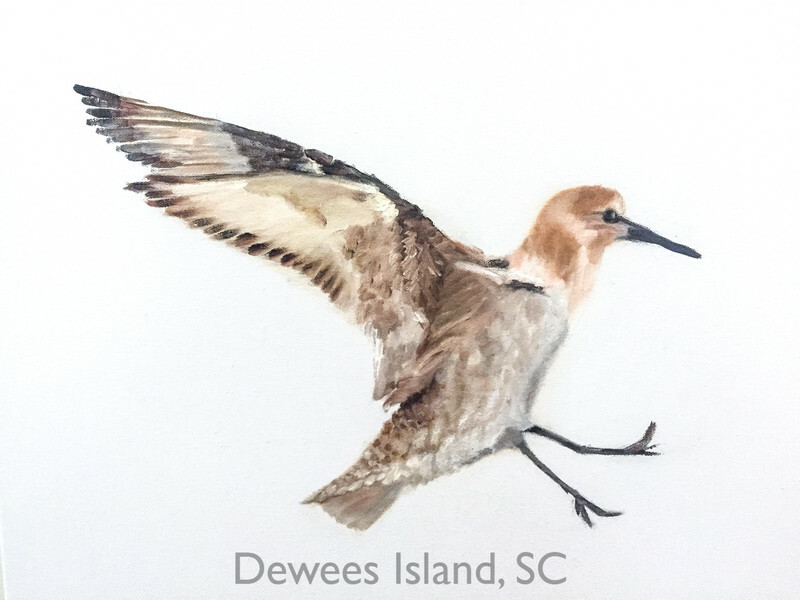 Diane Kliros, an island resident, accomplished artist and now the chair of the Dewees Island Arts Council, did a series of studies portraits of shorebirds that will benefit from improving Lake Timicau. 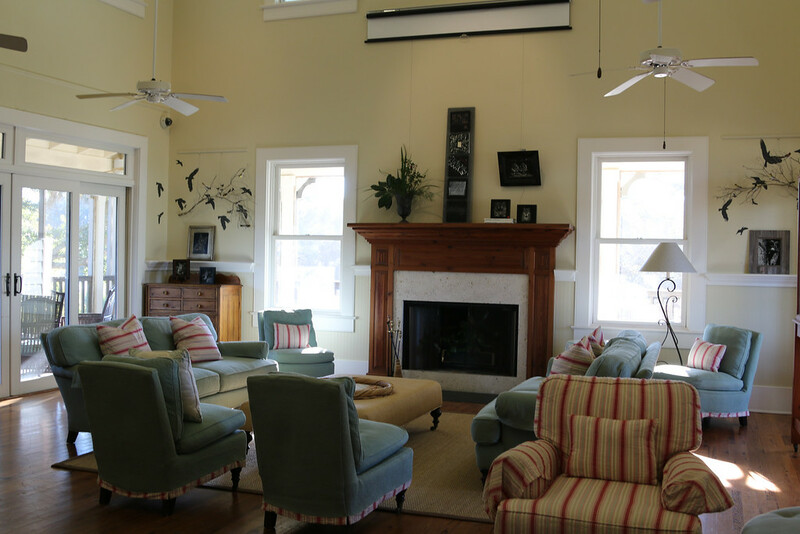 They originally hung in the hall to the dining room, and are now featured above the fireplace. 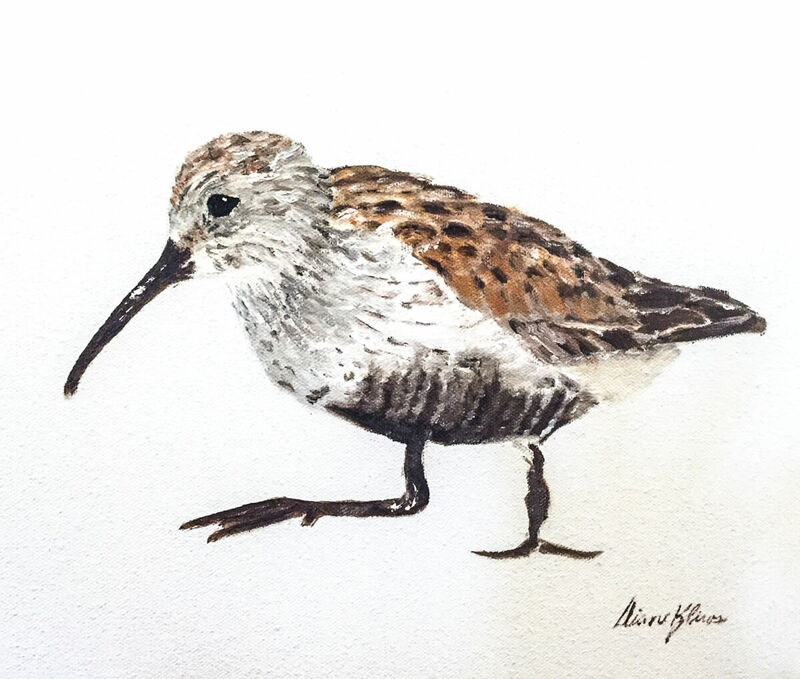 They really capture the essence of these birds, reflecting the extensive research Diane did until she was happy with the portraits and colors. 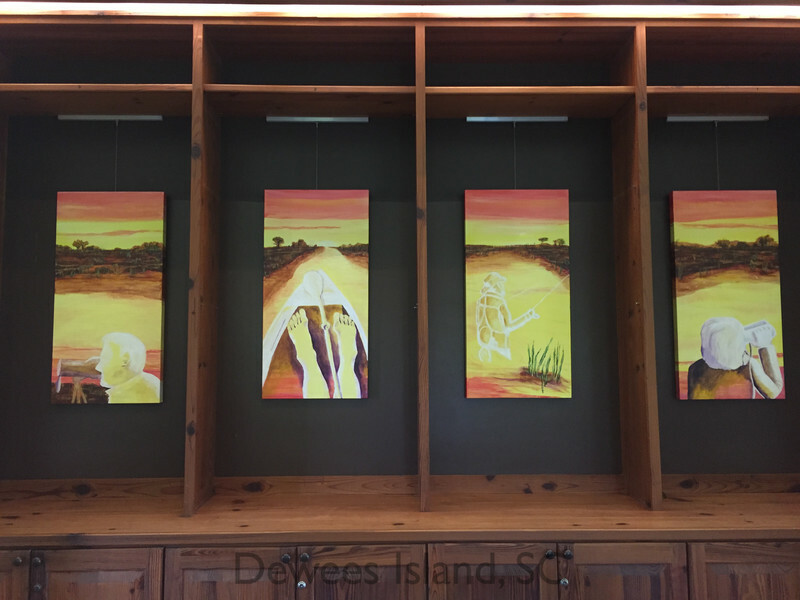 At tonight’s reception, Diane will be presenting the pictures to the photographers, and giclees of the art will become part of the island’s permanent collection. In addition, the Arts Council/Conservancy will be ordering prints, giclees, and notecards if people are interested in their own copies. 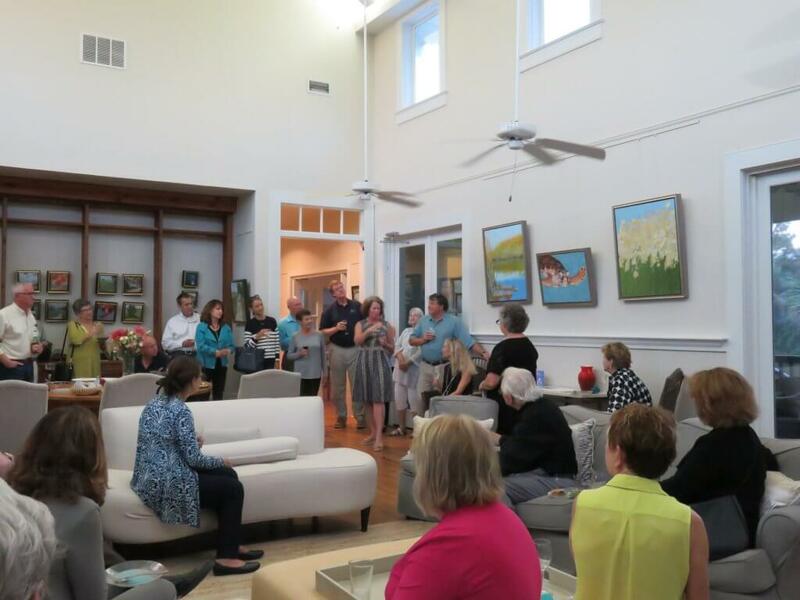 Tonight’s toast to the shorebird collection will begin at 5:30 at Huyler House. 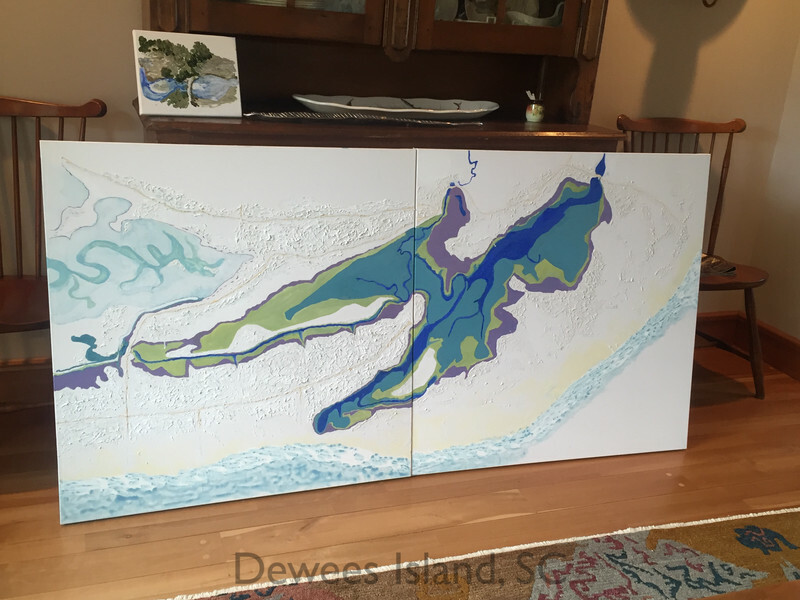 Champagne toast and munchies provided by the Dewees Island Conservancy. 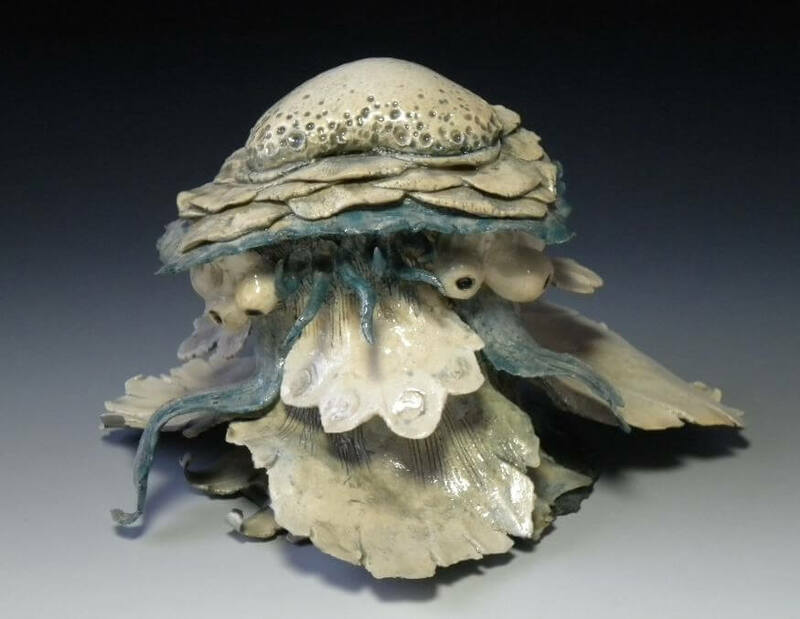 The newest Arts Council exhibit at Huyler House features the work of Susan Mashman and Esther Doyle. 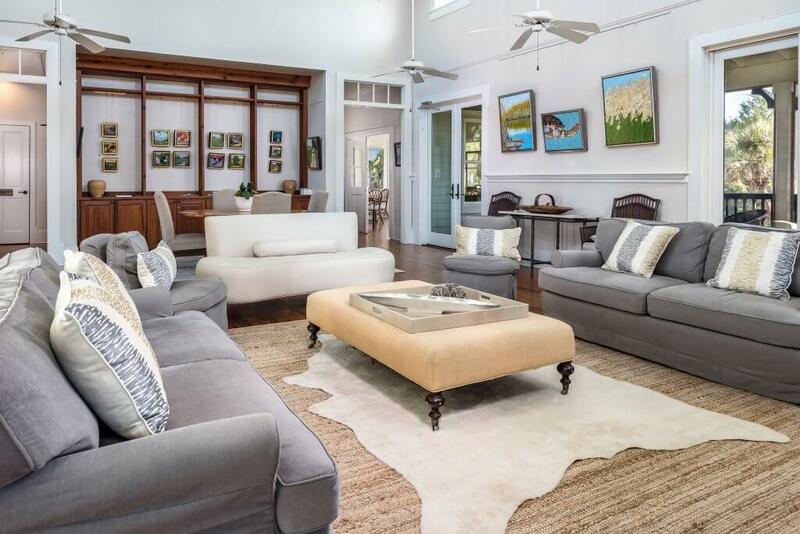 It has been up since January 16, and you need to be sure to catch it before it’s taken down for the annual POA Homeowner’s weekend. 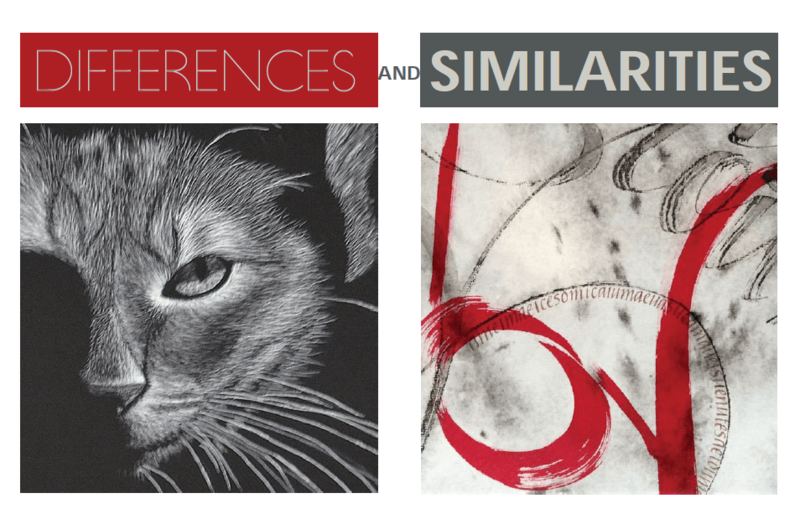 Called Differences and Similarities, the show explores really interesting art from these two island artists. 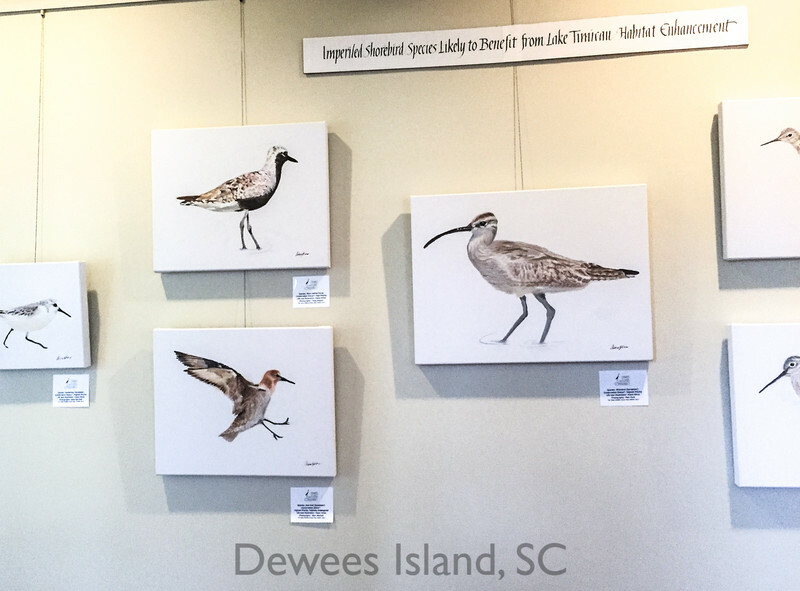 In addition, they are both donating proceeds to the Dewees Island Conservancy, so stop by and pick out your art whenever you get a chance. 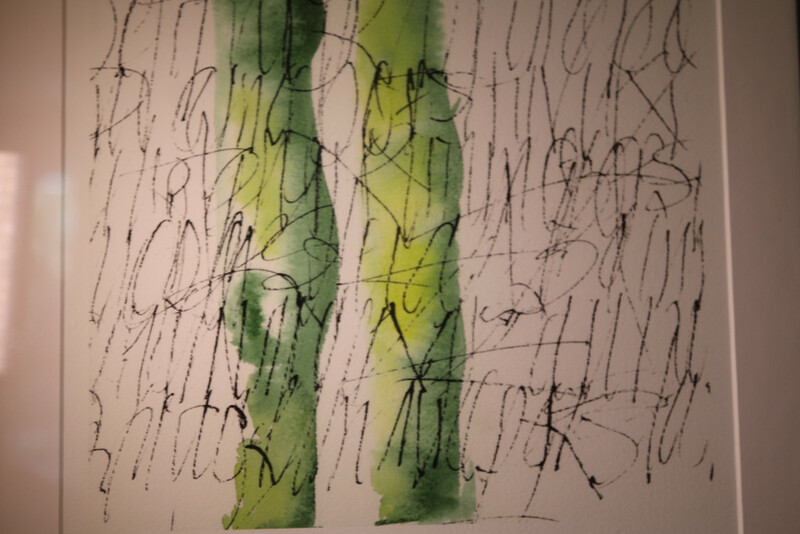 Susan Mashman is a calligrapher with 30 years of professional experience. She did extensive training with the Queen’s calligrapher, and ran a successful calligraphy business in Connecticut, where she and her employees contracted for weddings, stationary stores, etc. 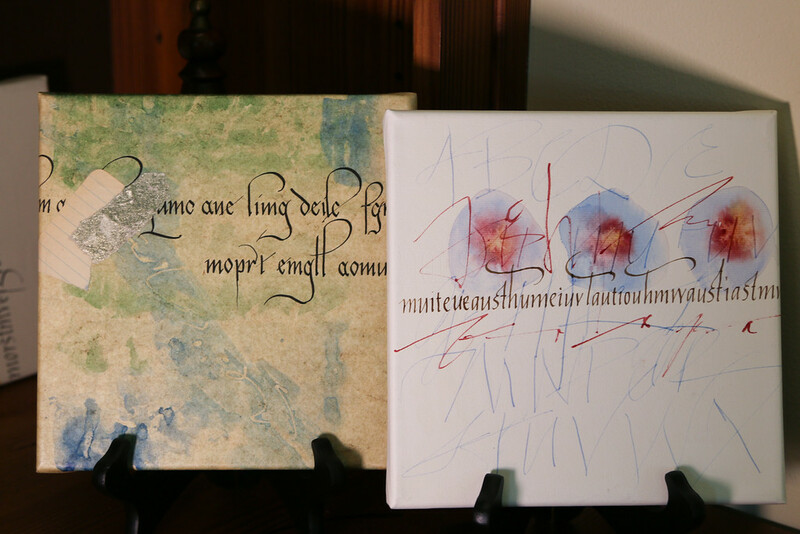 This exhibit is her first big art show, and it features her exploration of calligraphy and the intersection of art and the demise of the handwritten word. 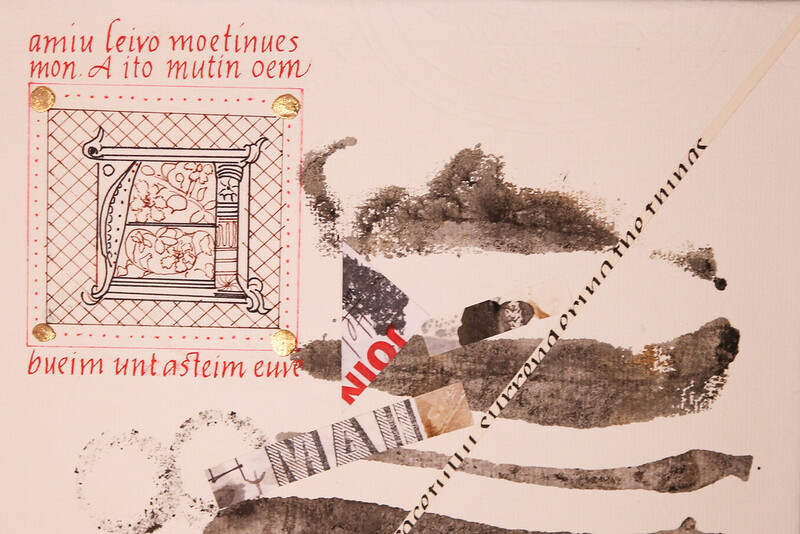 Her work uses an ascemic language: the letters and structure are familiar but they have no actual meaning. The fact that it’s not real language is her comment on the fact that students no longer learn handwriting in school, and with digital communication, the art of handwriting is fading with each year. Changes in our society have been making the need for hand lettering less and less necessary, and this skill may even be on the verge of becoming defunct! Children are no longer pressed to learn penmanship; instead from an early age, they are using tablets to communicate. Adults are emailing and tweeting and facebook; shopping lists are on phones, and no one has a pen or pencil on hand. Indeed, mankind seems to be losing the skill of handwriting. To me, this loss is a tremendously important step. For thousands of years, mankind has written words creating a direct link between the writer and the reader. Sadly this bond is, if not disappearing, certainly irrevocably changing the need to write by hand. We have also created the emoji, a symbol which can substitute for an entire paragraph or thought. With this exhibit, I have tried to document these changes in our civilization. 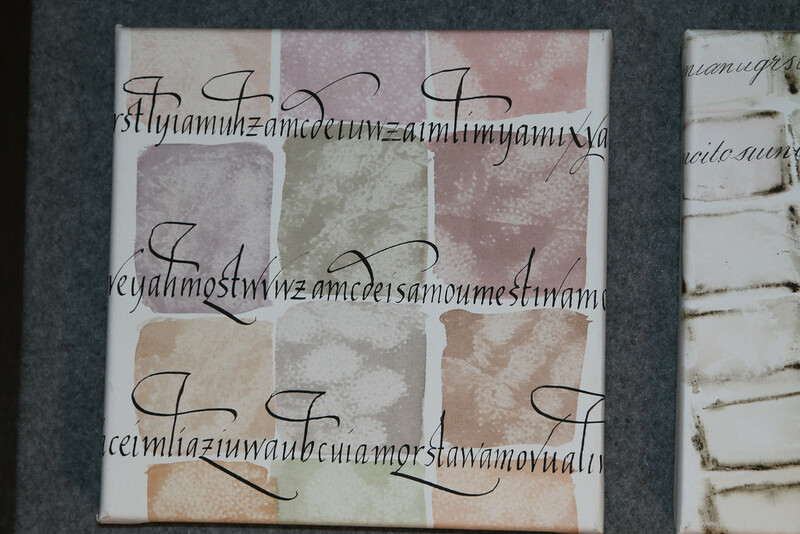 My canvasses represent our past as our letters lose their meaning and become ASEMIC. They have remnants of hand lettering and are “letterly,” but are not legible. 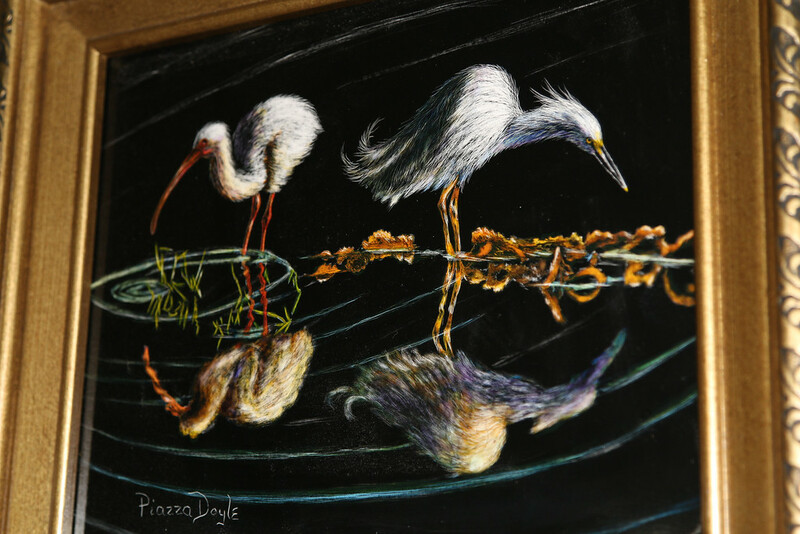 Esther Piazza Doyle is an island resident who works with a variety of media. Her work in this exhibition is an incredible series of drawings using scratchboard art, a medium Esther is drawn to because of the incredible precision it allows. 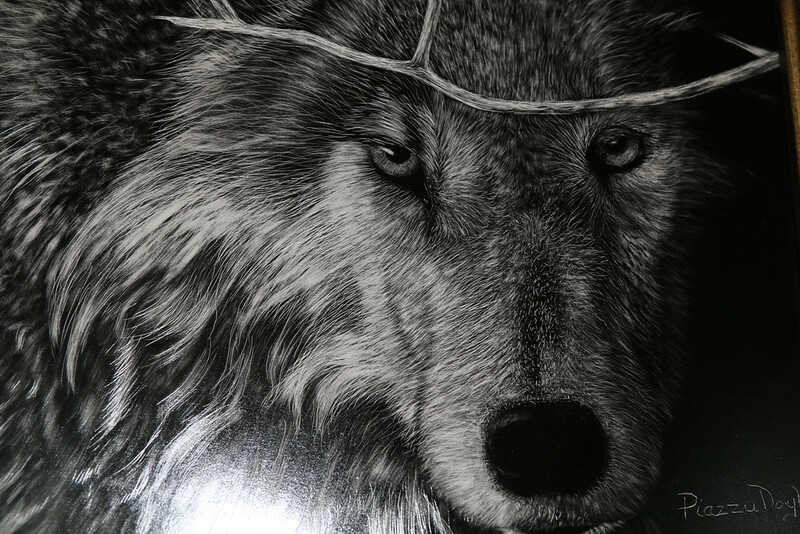 SCRATCHBOARD art originated in the 19th century in Europe and is a form of direct engraving. Under a top layer of black India ink is a layer of kaolin clay on a board. 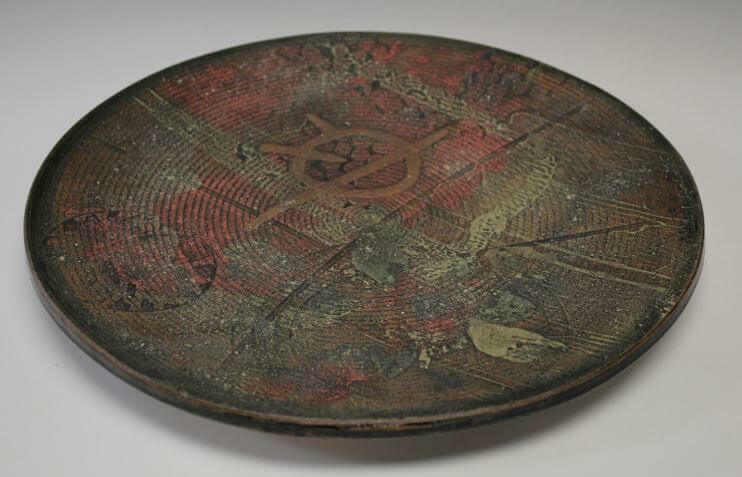 Multi-colored layers can also be used or color applied after the etching, if desired. It became a popular medium for illustrations due to its clear, fine lines that could be photographed without losing quality. In the 1930s to 1950s, it was one of the preferred techniques for medical, scientific, and product printing. The engraving is accomplished by using sharp instruments primarily, such as an Exacto knife or scalpel. 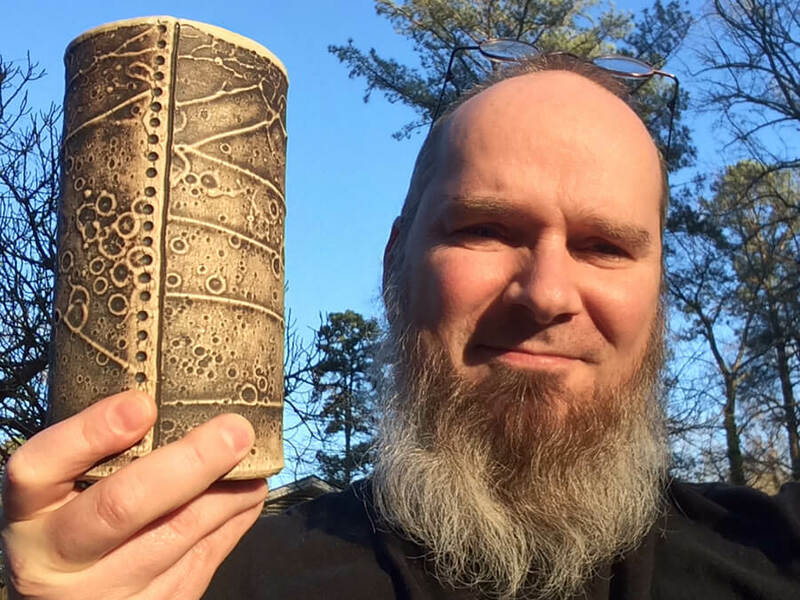 However, other tools such as sandpaper, steel wool, brushes, and any tool the imagination can provide are also practiced. 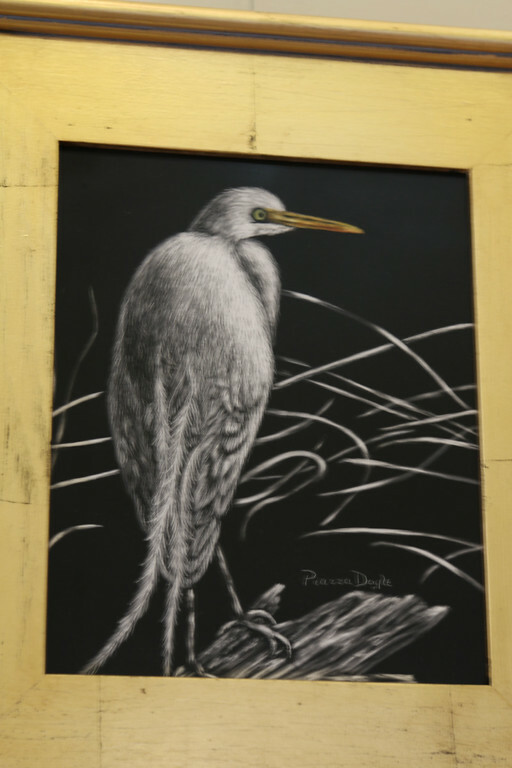 Scratchboard is not widely known and is considered by many artists to be one of the most challenging mediums. 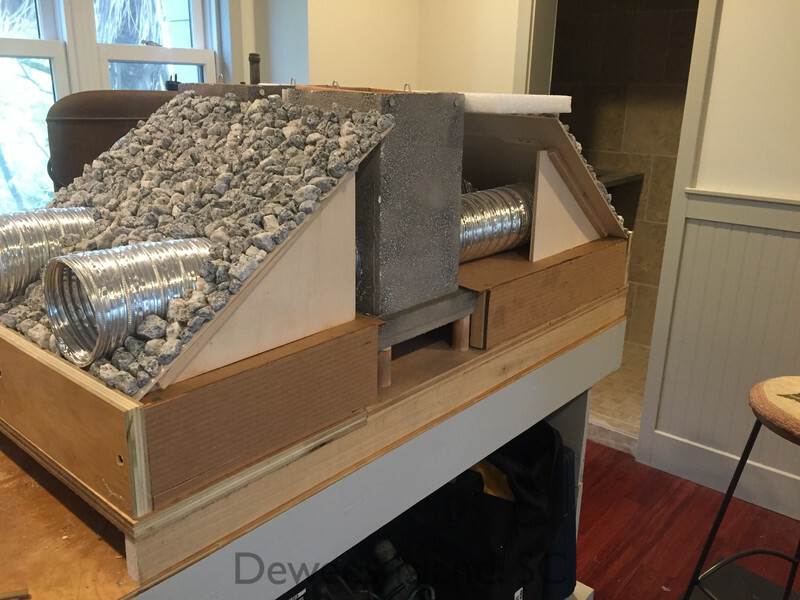 It is a very time consuming work as all textures are created by fine scratches. 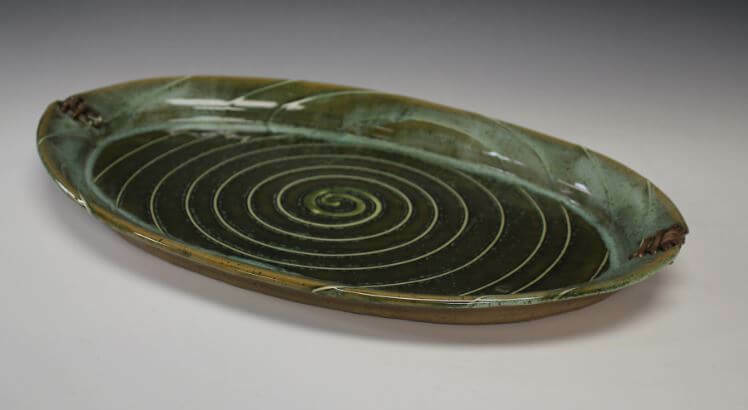 Some of Esther’s work looks photographic, it’s so precise, and a single work can take days to complete.